Objective: The purpose of this study was to compare the marginal gap of E-max press, and E.max computer-aided design and computer-assisted manufacturing (CAD-CAM) lithium disilicate (LD) ceramic crowns fabricated by using conventional technique and CAD-CAM technique. Materials and Methods: This was an in vitro experimental study carried out in Riyadh Elm University and King Saud University. A marginal gap of 30 LD crowns was evaluated by Stereomicroscopy. A total of 15 pressable LD (IPS E.max Press [Ivoclar Vivadent]) ceramic crowns were fabricated by using conventional lost wax pattern method (Group A). Digital impressions of the prepared dies were scanned and transferred to the milling machine. IPS E.max CAD (IPS E-max, Ivoclar, Amherst, NY, USA) LD blocks in shade Vita A2 were then milled by using DWX-50 machine for CAD-CAM crowns (Group B). Descriptive statistics of mean and standard error of marginal gaps for both groups were recorded and compared by applying Mann–Whitney U-test. All the data were analyzed by using statistical analysis software SPSS version 21.0 (Armonk, NY, USA: IBM Corp). Results: The LD crowns prepared by CAD-CAM technology (26.80 ± 3.4 μm) had significantly lower (P < 0.001) marginal gap than the LD pressed crowns (38.8 ± 2.3 μm) fabricated by conventional technique. 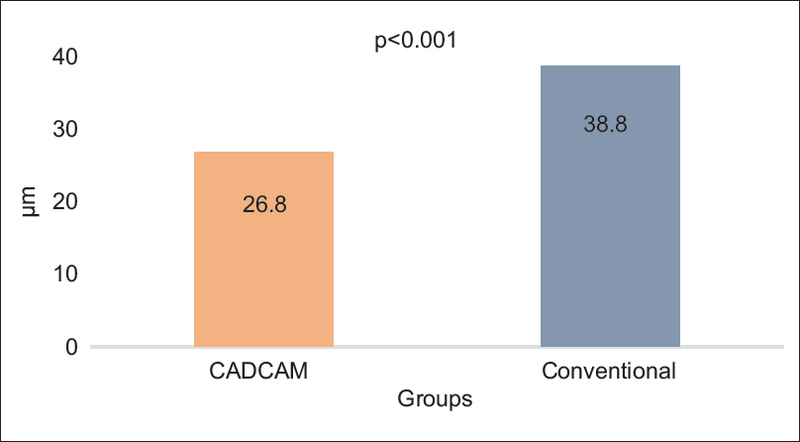 The marginal gaps between CAD-CAM versus conventional groups exhibited significant differences at (42.68 μm vs. 52.46 μm, U = 51.500, P = 0.011), Mesiobuccal (15.94 μm vs. 30.13 μm, U = 45.500, P = 0.005), distolingual (26.70 μm vs. 43.86 μm, U = 63.500, P = 0.042), and distal (12.38 μm vs 31.45 μm, U = 47.500, P = 0.006). Conclusions: Within the limitations of the study, it can be concluded that LD all ceramic crowns fabricated by using CAD-CAM techniques showed lesser marginal gap and better marginal fit compared to the conventional technique. Currently, two techniques are in use for the fabrication of all ceramic crowns. The IPS E.max press technique that utilizes heat-process in which the LD ingots are subjected to hot-pressing by means of pneumatic ram inside the porcelain furnace to press ceramic bars into the molds. Another fabrication technique is the computer-aided design and computer-assisted manufacturing (CAD-CAM) system computer-aided design and computer-aided manufacturing technology introduced in the dental field in the year 1980s. The CAD-CAM technology charge-coupled camera device to obtain an abutment tooth to produce three-dimensional (3D) image, and ceramic block is then milled based on digital information. Restorations and crowns can be fabricated with in a single-patient visit. The conventional lost-wax pattern technique of crown fabrication is commonly employed and is considered as the gold standard. However, certain disadvantages such as ineffective use of manufacturing time and deficient technical skills are commonly related to the conventional fabrication technique., Moreover, experience and expertise are required in fabrication of ceramic restoration by conventional technique as it involves obtaining natural look like appearance and shaping of the final restoration under high shrinkage during baking process at high temperatures. Even after the final product may not be satisfy with high production cost in conventional technique. On the contrary, the fabrication of crowns in porcelain blocks by using CAD-CAM technology less costly due to the mass production and almost no internal defects in the milled crowns. However, the fabrication of the crowns with conventional technique involves wax and baking at high temperature with more likely risk of developing high internal porosities. Previous studies compared the marginal fit of LD crowns processed by the heat-press technique with the fit of those fabricated by the CAD-CAM technique and observed that CAD-CAM LD crowns yielded poorer marginal fit compared with heat-pressed restorations., On the contrary, the latest literature on this subject has reported that the CAD-CAM ceramic restorations having superior fit when compared to the crowns fabricated by heat-press technique.,, However, Papadiochou and Pissiotis did not observe any superiority of the of CAD-CAM milling over the casting technique about the marginal adaptation. Inconsistencies in previously reported studies have created a dilemma regarding marginal fit of restoration fabricated by CAD-CAM and conventional techniques. Hence, there is a need to conduct a study on comparative evaluation of marginal fit of the LD ceramic crowns fabricated by conventional technique and CAD-CAM techniques. This study also helps to support the existing literature. Hence, the purpose this in vitro study was to compare the marginal fit of E-max press and E.max CAD/CAM LD ceramic crowns fabricated by using conventional technique and CAD/CAM technique. The proposed null hypothesis was that there are no significant differences between marginal gaps of ceramic crowns fabricated by conventional technique and CAD-CAM technique. A sample size of 30 (Group A = 15, Group B = 15) was calculated based on large effect size, alpha error probability of (α = 0.05), power (1-β err P = 0.87) and allocation ratio (N2/N1 = 1). The research proposal submitted to the Research Center of Riyadh Elm University and the Institutional Review Board gave approval for the study (RC/IRB/2016/580). A prepared tooth # 16 was selected from a demo model (CEREC AC Modell, Ivoclar vivadent, USA). The preparation had a heavy chamfer finish line (135°, 1 mm thickness), a smooth continuous margin, no irregularities, a total convergence angle of 10°, axial surface height of 6 mm, and 2 mm of occlusal reduction. To eliminate the effect of impression and pouring inconsistencies, a cobalt chrome metal die was fabricated and used as the definitive die. The demo model (CEREC AC Modell, Ivoclar Vivadent, USA) was scanned using a 3D-laser scanner (Smart Optical 3D scanner, Open Technology, Italy)®. The data was then transferred into a software (Exocad software, Germany)® to mill a metallic master die (Mteal Alloy, Mesa Italy) in the computer-aided machine (Roland, California, USA)® to generate a definitive die simulating all ceramic preparation. After milling metal, die was smoothened with a rubber wheel and polished with pumice to avoid any interference with the seating of the crowns. 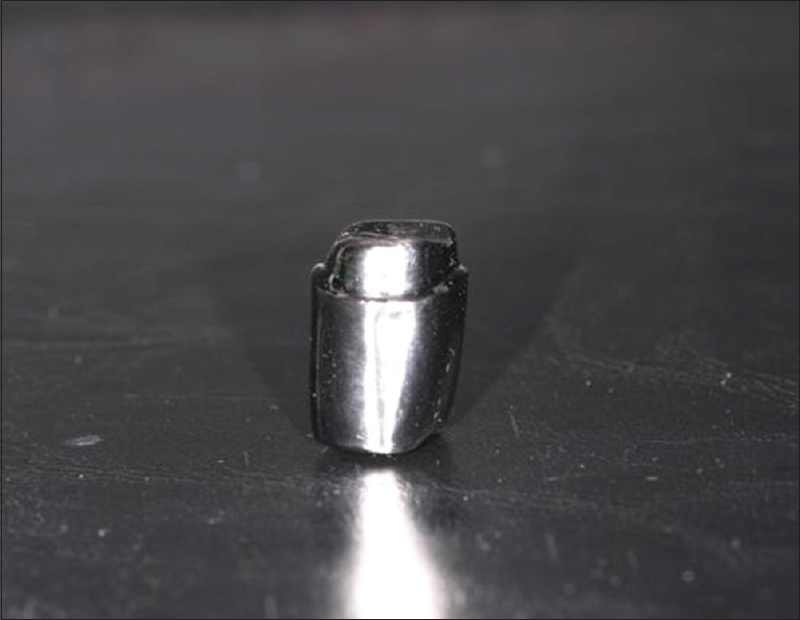 This metal die was then used to assess the marginal fit of the crowns fabricated by the CAD-CAM and conventional techniques [Figure 1]. Impressions of the prepared master die were taken with polyvinyl siloxane (Doublident, Willman and Pein GmbH, Germany). From this impression, 15 stone dies were poured with Type IV dental stone (professional snow rock/die stone type 4/Korea). An experienced laboratory technician trimmed each die stone and opened the margins; a die spacer (Durolan/dental future system/Germany) applied to create a space for the cement. Later on, wax build-up and sprue attachment were carried out. The wax pattern fixed to the center of a casting ring at 15° to the investment (Maruvest speed/Megadental/Germany) wax was burned out to eliminate it completely. LD ingots placed in casting ring and heat pressed for 25 min within the furnace. Afterward, the casting ring was trimmed by a diamond disc and sandblasting procedure was carried out. The sprue attachment was cut staining and glazing of the ceramic crown was accomplished. Optical impressions of the prepared dies were scanned by using the (Exocad smart optical 3D-scanner/open technologies/Italy) and the data have been transmitted to a software program (DWX-50 software/Easy shape by Roland/Australia) to design the crowns, a milling unit (DWX-50 dental milling machine/Roland/North America) used to fabricate 15 IPS E.max CAD-CAM crowns. All the IPS E.max Press crowns and IPS E.max CAD-CAM crowns were glazed and subjected to measurement of marginal gap [Figure 2]. The vertical distance between the finish line and the most apical part of the crown represented the marginal gap. A custom-made holder with a special pin to lock the specimen in place on the corresponding metal die was prepared [Figure 3]. Eight points (buccal, lingual, distal, mesial, mesiolingual, mesiobuccal, distolingual, and distobuccal) were measured by fixing the specimens into a custom holder loaded horizontally on the stage of a digital microscope (Digital microscope KH-7700 Hirox company/USA) under ×50 magnification. 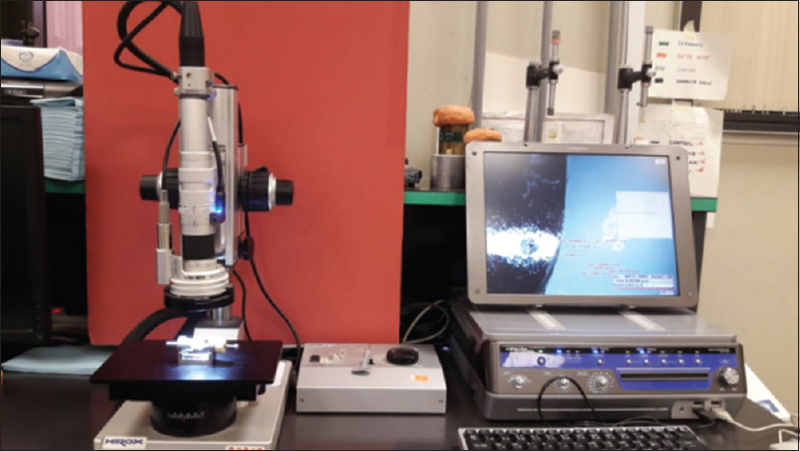 This digital microscope was a stereomicroscope with a microscope camera connected to a software program [Figure 4]. The data obtained from all the measurements were entered into the statistical analysis software SPSS version 21.0 (Armonk, NY, USA: IBM Corp). Descriptive statistics of mean, standard error (SE), and mean ranks were calculated for marginal discrepancy of the crowns. Normality of the checked with Shapiro–Wilk test and the data showed nonnormal distribution (P < 0.05); hence, Mann–Whitney U test was applied to compare between the marginal gap of crowns prepared with CAD-CAM and conventional crowns. The level of significance was set at P < 0.05 for all statistical purposes. The marginal gap of each individual specimen was measured at eight sites, and the mean (±SE) value was reported in micrometers (μm). The mean marginal gap for the conventional crowns was higher than those of the CAD-CAM crowns. Conventional crowns showed the highest and lowest mean marginal gap at buccal surface (52.46 ± 6.48 μm) and at mesial surface (29.22 ± 6.07 μm), whereas, CAD-CAM crowns showed the highest marginal gap at buccal (42.68 ± 19.29 μm) and distal surfaces (12.38 ± 4.42 μm). In general, the crowns produced by conventional technique showed higher marginal gaps compared to that of the crowns fabricated by CAD-CAM technology, as shown in [Table 1]. Mann–Whitney U-test applied to compare the mean marginal gap between ceramic crowns prepared by using conventional and CAD-CAM techniques in different surfaces. Mean values of marginal gap between CAD-CAM versus conventional groups exhibited significant differences at buccal (42.68 vs. 52.46 μm, U = 51.500, P = 0.011), Mesiobuccal (15.94 vs. 30.13 μm, U = 45.500, P = 0.005), distolingual (26.70 vs. 43.86 μm, U = 63.500, P = 0.042), and distal (12.38 vs. 31.45 μm, U = 47.500, P = 0.006) surfaces. On the contrary, marginal gap did not differ significantly in mesial, mesiolingual, lingual, and distobuccal surfaces of conventional and CAD-CAM groups [Table 2]. In general, crowns fabricated with the CAD-CAM (26.80 μm) technologies demonstrated significantly lower marginal gap compared to the crowns fabricated with the conventional (38.8 μm, P < 0.001) technique as shown in [Figure 5]. Marginal fit is a significant factor in the success and durability of dental restorations. The main aim of this in vitro study was to compare the marginal gaps of LD ceramic crowns fabricated using conventional technique and CAD-CAM techniques. The results indicated that the fabrication technique has a remarkable effect on marginal fit of the crown. E.max CAD-CAM LD ceramic crowns produced the smallest (mean ± SE) marginal gap at (12.38 ± 4.42 μm) and highest marginal gap at (42.68 ± 19.29 μm), whereas conventional technique produced a smallest marginal gap at (29.22 ± 6.07 μm) and highest marginal gap at (52.46 ± 6.48 μm). In view of above-mentioned findings, the primary outcome measure (marginal gap) was found to be significantly lower in LD ceramic crowns fabricated by using CAD-CAM technique compared to the LD ceramic crown fabricated by conventional technique. Hence, the null hypothesis of no significant difference in marginal gap of LD ceramic crowns fabricated by using CAD-CAM technique and conventional technique was rejected. A total mean marginal gap for CAD-CAM group was 26.80 μm, whereas the conventional group gave the mean value of 38.83 μm. In spite of the significant differences, both fabrication techniques produced marginal gap of <100 μm. This is considered as an acceptable marginal gap produced during fabrication of the LD ceramic crowns. When comparing our findings with Neves et al., it can be acknowledged that the marginal gaps resulting from CAD-CAM were lower as compared to conventional technique of crown fabrication. This finding supports the results of our investigations. Similar outcome was revealed in a study conducted by Alqahtani in which marginal fit of crowns prepared by CAD-CAM systems highly improved compared to the conventional procedures. This suggests the effectiveness of using the computer-aided techniques in providing reliable restorations to the patients. In general, the LD crowns fabricated by conventional technique showed higher marginal gap compared to the crowns fabricated by CAD-CAM technology. These differences in the marginal gap could be due to the precision of digital scanning or CAM milling. Our study also compared the mean values of marginal gaps on different surfaces between ceramic crowns fabricated by conventional and CAD-CAM techniques, and the results showed that CAD-CAM crowns had significantly lesser mean marginal gaps at buccal, mesiobuccal, distolingual, and distal surfaces compared to the conventionally fabricated crowns. This may be suggestive of higher precision and milling capability of the CAD-CAM systems. On other surfaces marginal fit was similar to that of the conventional crowns. The strengths of the study included the in vitro experimental study design carried out in a laboratory condition. This removed the possibility of clinical errors such as limited of access, saliva, bleeding, finish lines, and the effect of impressions (conventional or optical) techniques. 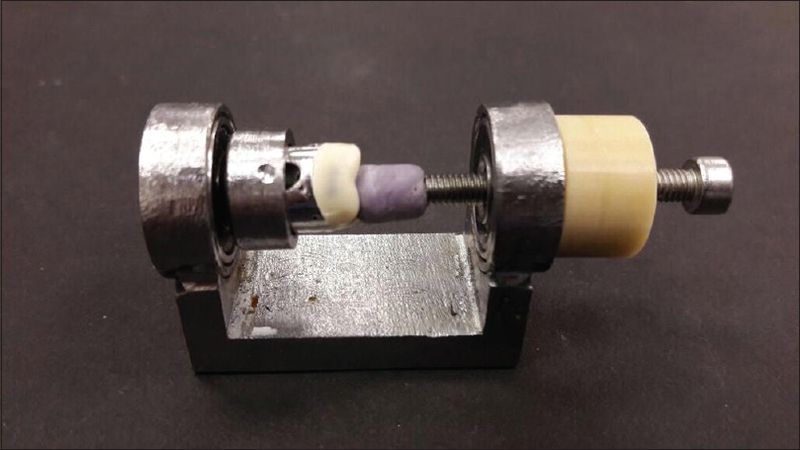 To avoid manual tooth preparation discrepancies, a demo model simulating all-ceramic crown preparation was scanned and a cobalt-chromium definitive die fabricated to measure against the marginal fit of the crowns. A single-trained investigator performed the tasks of impression making by optical techniques and conventional method. A custom-made holder with a special pin to lock specimen on the metal die was prepared thereby standardizing the all the parameters of measuring the marginal gap. No attempt was made to cement the crowns; instead the special pin locked the specimen on the die thereby eliminating the possibility of marginal errors from underlying thickness of the cement. Unlike other studies, our study also had some limitations. The study was conducted under in vitro conditions. This may not reflect the true intraoral environment. The clinical importance of the study is that CAD-CAM technique of crown fabrication is superior than the conventional preparations due to its accuracy of digital impression and milling quality. This in vitro study provided further strength to the evidence supporting lower marginal gap of ceramic crowns fabricated by CAD-CAM techniques compared to the conventional fabrication technique. However, future in vitro and clinical research is warranted to support the findings of the current study in an era of technological advancements. Within in limitations of this in vitro study, it can be concluded that the E.max LD ceramic crowns prepared by CAD-CAM technologies exhibited lower marginal gap and better fit compared to the E.max press LD ceramic crowns fabricated by conventional techniques. Hence, CAD-CAM technology can be considered as superior and alternative to the conventional method of fabrication of the crowns. Aslam A, Khan DA, Hassan SH, Ahmed B. Ceramic fracture in metal-ceramic restorations: The aetiology. Dent Update 2017;44:448-50, 453-4, 456. Chen J, Cai H, Ren X, Suo L, Pei X, Wan Q, et al. Asystematic review of the survival and complication rates of all-ceramic resin-bonded fixed dental prostheses. J Prosthodont 2018;27:535-43. Alqahtani F. Marginal fit of all-ceramic crowns fabricated using two extraoral CAD/CAM systems in comparison with the conventional technique. Clin Cosmet Investig Dent 2017;9:13-8. Rai R, Kumar SA, Prabhu R, Govindan RT, Tanveer FM. Evaluation of marginal and internal gaps of metal ceramic crowns obtained from conventional impressions and casting techniques with those obtained from digital techniques. Indian J Dent Res 2017;28:291-7. Zimmermann M, Valcanaia A, Neiva G, Mehl A, Fasbinder D. Influence of different CAM strategies on the fit of partial crown restorations: A digital three-dimensional evaluation. Oper Dent 2018;43:530-8. Daguano JK, Milesi MT, Rodas AC, Weber AF, Sarkis JE, Hortellani MA, et al. In vitro biocompatibility of new bioactive Lithia-silica glass-ceramics. Mater Sci Eng C Mater Biol Appl 2019;94:117-25. Al Hamad KQ, Obaidat II, Baba NZ. The effect of ceramic type and background color on shade reproducibility of all-ceramic restorations. J Prosthodont 2018. Doi: doi.org/10.1111/jopr.13005. [Epub ahead of print]. Simeone P, Gracis S. Eleven-year retrospective survival study of 275 veneered lithium disilicate single crowns. Int J Periodontics Restorative Dent 2015;35:685-94. Yang Y, Yu J, Gao J, Guo J, Li L, Zhao Y, et al. Clinical outcomes of different types of tooth-supported bilayer lithium disilicate all-ceramic restorations after functioning up to 5 years: A retrospective study. J Dent 2016;51:56-61. Mously HA, Finkelman M, Zandparsa R, Hirayama H. Marginal and internal adaptation of ceramic crown restorations fabricated with CAD/CAM technology and the heat-press technique. J Prosthet Dent 2014;112:249-56. Renne W, McGill ST, Forshee KV, DeFee MR, Mennito AS. Predicting marginal fit of CAD/CAM crowns based on the presence or absence of common preparation errors. J Prosthet Dent 2012;108:310-5. Eames WB, O'Neal SJ, Monteiro J, Miller C, Roan JD Jr., Cohen KS, et al. Techniques to improve the seating of castings. J Am Dent Assoc 1978;96:432-7. Beuer F, Schweiger J, Edelhoff D. Digital dentistry: An overview of recent developments for CAD/CAM generated restorations. Br Dent J 2008;204:505-11. Keshvad A, Hooshmand T, Asefzadeh F, Khalilinejad F, Alihemmati M, Van Noort R, et al. Marginal gap, internal fit, and fracture load of leucite-reinforced ceramic inlays fabricated by CEREC inLab and hot-pressed techniques. J Prosthodont 2011;20:535-40. Suárez MJ, González de Villaumbrosia P, Pradíes G, Lozano JF. Comparison of the marginal fit of procera AllCeram crowns with two finish lines. Int J Prosthodont 2003;16:229-32. Reeves J. Periodontal health – Challenges in restorative dentistry. Prim Dent J 2014;3:73-6. Reiss B, Walther W. Clinical long-term results and 10-year Kaplan-Meier analysis of CEREC restorations. Int J Comput Dent 2000;3:9-23.
de Paula Silveira AC, Chaves SB, Hilgert LA, Ribeiro AP. Marginal and internal fit of CAD-CAM-fabricated composite resin and ceramic crowns scanned by 2 intraoral cameras. J Prosthet Dent 2017;117:386-92. Dahl BE, Dahl JE, Rønold HJ. Digital evaluation of marginal and internal fit of single-crown fixed dental prostheses. Eur J Oral Sci 2018;126:512-7. Ortega R, Gonzalo E, Gomez-Polo M, Lopez-Suarez C, Suarez MJ. SEM evaluation of the precision of fit of CAD/CAM zirconia and metal-ceramic posterior crowns. Dent Mater J 2017;36:387-93. Şeker E, Ozcelik TB, Rathi N, Yilmaz B. Evaluation of marginal fit of CAD/CAM restorations fabricated through cone beam computerized tomography and laboratory scanner data. J Prosthet Dent 2016;115:47-51. Yuzbasioglu E, Kurt H, Turunc R, Bilir H. Comparison of digital and conventional impression techniques: Evaluation of patients' perception, treatment comfort, effectiveness and clinical outcomes. BMC Oral Health 2014;14:10. Mounajjed R, M Layton D, Azar B. The marginal fit of E.max press and E.max CAD lithium disilicate restorations: A critical review. Dent Mater J 2016;35:835-44. Miwa A, Kori H, Tsukiyama Y, Kuwatsuru R, Matsushita Y, Koyano K, et al. Fit of E.max crowns fabricated using conventional and CAD/CAM technology: A comparative study. Int J Prosthodont 2016;29:602-7. Mostafa NZ, Ruse ND, Ford NL, Carvalho RM, Wyatt CC. Marginal fit of lithium disilicate crowns fabricated using conventional and digital methodology: A three-dimensional analysis. J Prosthodont 2018;27:145-52. Papadiochou S, Pissiotis AL. Marginal adaptation and CAD-CAM technology: A systematic review of restorative material and fabrication techniques. J Prosthet Dent 2018;119:545-51. Demir N, Ozturk AN, Malkoc MA. Evaluation of the marginal fit of full ceramic crowns by the microcomputed tomography (micro-CT) technique. Eur J Dent 2014;8:437-44. Neves FD, Prado CJ, Prudente MS, Carneiro TA, Zancopé K, Davi LR, et al. Micro-computed tomography evaluation of marginal fit of lithium disilicate crowns fabricated by using chairside CAD/CAM systems or the heat-pressing technique. J Prosthet Dent 2014;112:1134-40. Azar B, Eckert S, Kunkela J, Ingr T, Mounajjed R. The marginal fit of lithium disilicate crowns: Press vs. CAD/CAM. Braz Oral Res 2018;32:e001. Dolev E, Bitterman Y, Meirowitz A. Comparison of marginal fit between CAD-CAM and hot-press lithium disilicate crowns. J Prosthet Dent 2019;121:124-8. Azarbal A, Azarbal M, Engelmeier RL, Kunkel TC. Marginal fit comparison of CAD/CAM crowns milled from two different materials. J Prosthodont 2018;27:421-8. Al Hamad KQ, Al Rashdan BA, Al Omari WM, Baba NZ. Comparison of the fit of lithium disilicate crowns made from conventional, digital, or conventional/Digital techniques. J Prosthodont 2018. Doi: doi.org/10.1111/jopr.12961. [Epub ahead of print]. Tsirogiannis P, Reissmann DR, Heydecke G. Evaluation of the marginal fit of single-unit, complete-coverage ceramic restorations fabricated after digital and conventional impressions: A systematic review and meta-analysis. J Prosthet Dent 2016;116:328-3500. Chochlidakis KM, Papaspyridakos P, Geminiani A, Chen CJ, Feng IJ, Ercoli C, et al. Digital versus conventional impressions for fixed prosthodontics: A systematic review and meta-analysis. J Prosthet Dent 2016;116:184-90.e12. Takeuchi Y, Koizumi H, Furuchi M, Sato Y, Ohkubo C, Matsumura H, et al. Use of digital impression systems with intraoral scanners for fabricating restorations and fixed dental prostheses. J Oral Sci 2018;60:1-7.